One thing I’m sure we’ll all agree on is that buying bottled water makes us feel like we’re being ripped off. Why pay for something that we are lucky enough to have access to on tap? Unfortunately, the quality and taste of our tap water varies in different areas. In some areas it’s pure as anything, and refreshingly cold. However, for some hard water areas and areas where the water is treated with fluoride, it can leave an unpleasant metallic taste in your mouth which is nobody’s cup of tea. If you’re really fussy about your water, you can save money by investing in a water purifier jug. When you switch to filtered water, it’ll taste just as fresh as bottled water and we promise you won’t be able to tell the difference. We’re all looking for ways to make life easier, so filters that only need to be change every so often (i.e. once a month) are ideal. However, it is wise to check the style and brand of filter before choosing a jug, as some filters can become more hassle than they’re worth. Some cartridges take longer to filter, so you’ll need to remember to fill the jug on a regular basis otherwise you’ll be tempted back to bottled in no time. When choosing a jug, you may think that a funky shaped one looks cool, but you’ll be pretty peeved when you get it home and it doesn’t fit in your fridge door, so consider whether you must have your water chilled or not before buying a jug. 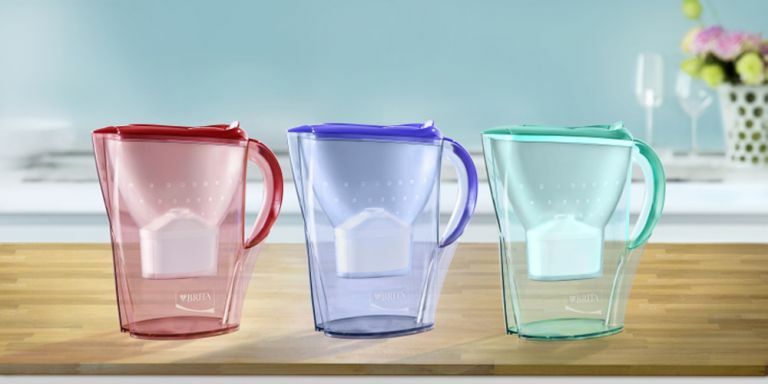 The Brita Marella XL Water Filter Jug is a reliable brand and is one of the best water purifier jugs for the fridge as its size and shape fits perfectly in the door. However, it is slightly deceptive in size, as 3.5 Litres is the total capacity but he filtered water capacity is only 2 Litres. This water purifier takes Brita MAXTRA filters which, although pricey, remove chlorine, limescale and all other impurities from your water successfully. Okay, so this may seem a little OTT, but this water purification system is designed for those who need long-term solutions. If you live in an area where the water isn’t safe to drink, or you don’t have access to tap water, this industrial option can purify even the dirtiest of water from rivers, ponds, and foreign water supplies. It’s huge, so we don’t blame you if you don’t want to lug it around, but it can be handy if you are going camping for a serious amount of time. Its filters only needs to be changed every 22,700 Litres so it’s not much hassle if you really must have purified water. Most of us carry a bottle of water in the car or to the gym, so this water bottle is a great alternative for when you’re on the move. The BRITA Fill and Go will save you money on bottled water every day, and filters are relatively cheap when bought in packs, but they do need to be changed once a week for the best tasting water. For the impatient, these bottles filter as you drink so you don’t have hang around just to quench your thirst. If you’re looking for a water purifier jug that matches your kitchen and doesn’t break the bank then this BWT Mineral Water Jug is the one to get. It comes in pretty much every primary colour and will fit in all fridge doors with ease. If you’re forgetful, the jug has an indicator on the side to remind you to change the cartridges. Be careful though, you are less likely to find replacement filters for these in your local supermarket like you can for brands like Brita. Still not convinced a water purifier jug can taste as good as bottled water? Well if drinking from a porcelain cylinder equipped with a bamboo stand doesn’t change your mind, we don’t know what will. Just a tiny bit off kilter and quite frankly completely absurd, we’re not sure if this is a fancy minimalist art feature or an X-rated BB8, but what we do know is this is drinking water at its finest. If you’ve got money to burn and love minimalist design, this could be an investment piece that adds to your home’s aesthetics and functionality. If you’re someone who hates everything mainstream, then you might not be a fan of this. But, everyone is going crazy over the benefits of activated charcoal lately so we just had to put it in! It’s been used in facemasks, toothpaste and now it’s being used to purify your water, too! Ultimately it does the same as any other filter, getting rid of unpleasant tastes and impurities, but the charcoal does last longer (up to 3 months) than a standard filter. So if you like the idea of the BRITA Fill & Go but don’t want to pay through the nose for cartridges every week, opt for this charcoal water filter. This jug is more about looking cool than doing its job, but we still want it! This water purifier jug boasts no frills but does what is says on the tin while making a funky accessory for your kitchen. It may look good, but it has no water chamber meaning it takes ages to fill up. If you’re more about aesthetics than optimum functionality then this jug is a low-cost addition to your kitchen.